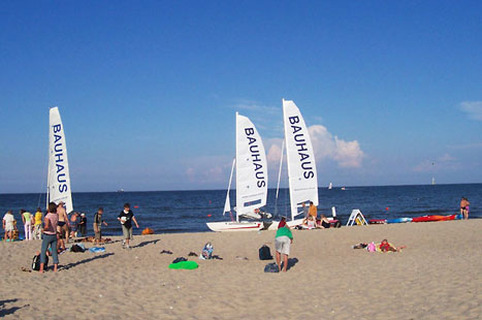 Sopot is famous for it's cornucopia of shops, restaurants, clubs, and cultural hot spots. Visitors flock to its shores for all those reasons, but once they arrive, many a tourist has been most enthralled by the sandy stretch of beach and all the summertime activities taking place there. While the Baltic doesn't provide the warmest and most welcoming water on earth, the beach is usually packed with sunbathers, volleyball enthusiasts, and partiers. If you'd like to swim, the water is of a comfortable temperature in late August and early September, but many people are content to simply stroll the beach and hunt for the amber that sometimes washes up in the small, rippling waves. Since the beach is a few kilometers long, you can walk and walk and never worry about running out of scenic horizon. The sand is reasonably soft and very clean, so kick off those sandals and dig your toes in! At night, especially on the weekends, the beach becomes the perfect place to hang out before entering a pub or disco. It's illegal to drink on the beach, but you'd never know it, as clusters of eager partygoers sit and chat under the starlight, drinking wine and beer purchased in the cheap grocery stores. If you're in the habit of throwing back a few drinks before you have to pay double the normal prices inside a club, then the beach is the place to do it. Interestingly, the beaches stay clean, as there is always a poorer citizen collecting everyone's cans and bottles. The free market has come to Poland! Legendary for its healing and restorative properties, the shores of Sopot have enchanted visitors for hundreds of years. Let the soothing ocean sounds provide a soundtrack for an exciting day, or the backdrop for romantic evening. The beach has something for everyone, whether you're a spa-seeking aristocrat or an avid athlete! And best of all, no recorded shark attacks in the history of the town! I enjoyed visiting Sopot in June of 1946 while working on a United Nations relief supply ship. We went to Sopot by train while our ship unloaded horses for Polish farmers. Great people! The best town in Poland, with the best night life. The beach is pretty good too! I used to go to Poland with my father when I was a teenager. I am going back tomorrow for the first time in 35 years, and cant wait to see how things have changed. Im sure it is still as beautiful as ever. Planning to be at sopot in june. it seems to be wonderful.